Hey, remember the iPad Pro 9.7? It has all the features of the Pro line, but is closed in the body of a good ol' iPad Air 2. It was later replaced by the iPad Pro 10.5, but it's still a pretty powerful tablet with its 2016 Apple hardware. Well, we found one at a pretty sweet price. iPad Pro 9.7 with 32 GB of memory and a cellular modem (Verizon edition, but now unlocked) for just $349.99. You've got your pick between Space Gray and Rose Gold and the units are refurbished. 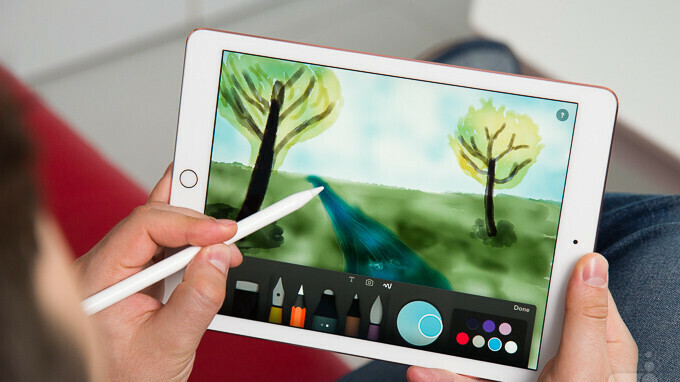 You get a device powered by Apple's A9X dual-core processor and 2 GB of RAM, which also supports the Smart Keyboard (you'll need to hunt down one made for the 9.7 model) and the Apple Pencil. So, as long as you don't need more space than the provided 32 GB, that's a pretty sweet deal right there! The current "cheap iPad" sold by Apple starts at $329, sure, but it doesn't have the quad speakers, the anti-glare coating, or the support for the iPad Pro accessories. I like how you show the pencil as well. However throw in another $100 for the Apple pencil. I will get that new Chrome tablet which includes a pen and Wacom support for a cheaper price. Plus it can run millions of Android apps as well as Chrome apps. Nothing like an iPad pro and my Galaxy s9 plus combo . You don't need to spend $100 on the Apple Pencil when you can get the Bamboo Fineline Stylus 3 for half that amount and have a better experience. Plus, the Bamboo works on iPhones too now. 32 gig and a terrible network is a no go. More interest in a new pro.